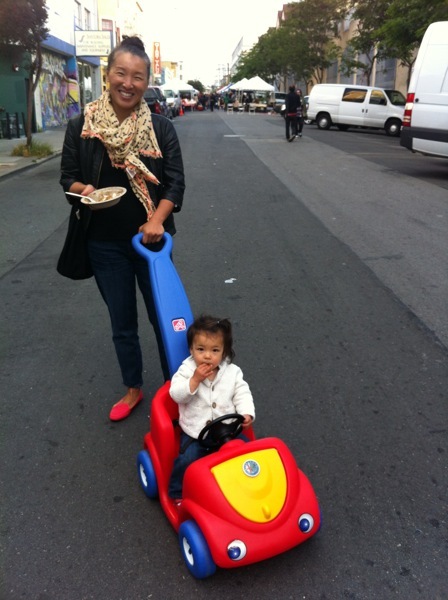 Meet Tina and Zoe (16 months), MCM regulars who love the music, food demos, and seeing their neighbors! How often do you come to the MCM? Every week, pretty much. What are you buying? Peaches from Twin Girls, a special order from Bok Ssam (in a bowl) so that Zoe can eat it. I love all the samples that the vendors give out, so that Zoe can try new things. Often, we get salmon from Coastside Farms or cakes from flourChylde. And, we LOVE getting the kettle corn from Peter’s Kettle Corn! What’s your favorite part of the market? We like the music, and also the cooking demos at the Urban Sprouts booth. I really like the guy who does them*; he’s always so engaging. It’s also nice to see people from the neighborhood. What’s the best kept secret at MCM, or something you would like people to know about? There are more food vendors than before; the market has really grown. Also, it’s a great place to have dinner, that’s why you see so many parents here. * Editor’s note: That’s Raul Hernandez with Urban Sprouts! Yay Raul! People of MCM: Kevin, Raffle Winner! Meet Kevin, who was the lucky winner of $50 towards shopping at MCM in our neighbor appreciation raffle! 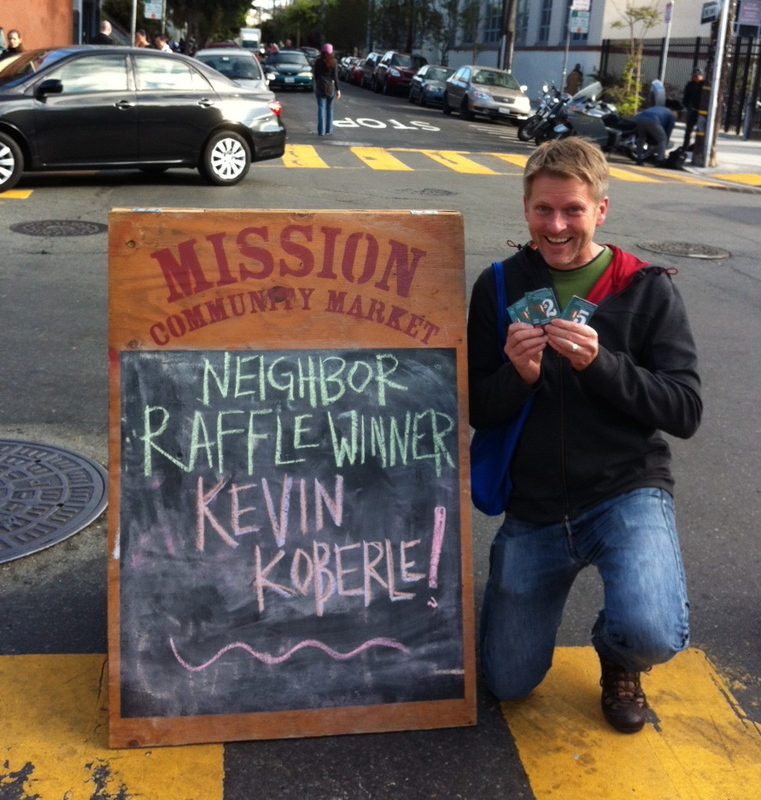 Neighbors who received an MCM flier on their door were eligible to enter, and Kevin took home the prize! How often do you come to the MCM? This is my third time! What are you buying? I bought dinner for us– pulled pork from 4505 Meats, a Korean Fried Chicken & Waffle Sandwich from Bok Ssam, and nachos from Chaac-Mool. I also got beets and spring onions from Blue House, nectarines from Twin Girls, raspberries from Yerena Farms, and a lamb tart from Marla Bakery. I even have $4 left for next week! What’s your favorite part of the market? I like that it’s so close. We don’t have a car, so it’s super easy and very straightforward. Also, we just met some neighbors here, and there’s a sense of community. What’s the best kept secret at MCM, or something you would like people to know about? There are not the same throngs of people here like other markets, it’s more mellow.